Putting things side by side to see how they compare to one another. These two share their unique perspectives on their friends-with-benefits relationship and what they've learned from each other. The facial expression of the other boxer is priceless. Stories about women going above and beyond for their fellow females. I'm not sure who got the bigger scare here! No getting out of this one. Everybody loves famous people, even famous people! 2016 Chevy Malibu reads incoming texts. These kids will live with their parent's poor naming choices forever. 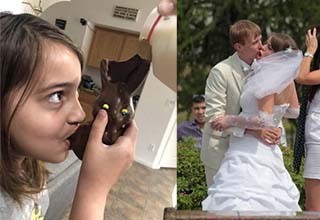 25 photos where one thing is not like the others. A Harlequin Macaw silences the other bird constantly interrupting him. Damnit mom, he kicked me first! WTF and Who Pays For This? What do two idiots with fireworks do? Shoot them at each other of course!